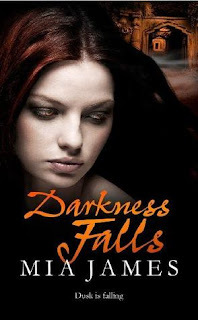 I was very excited to hear of Darkness Falls by Mia James, the sequel to By Midnight. By Midnight was the first book I finished this year, and I loved the combination of mystery, romance and creep factor involved in the story about an infestation of vampires in this fancy school near Highgate Cemetery. It was thrilling and exciting and I thought it would be a hard book to follow. I'm thrilled to say that if anything, I enjoyed Darkness Falls even more! Don't read any further if you haven't read By Midnight, because there are lots of spoilers straight ahead! Darkness Falls begins several months after the shocking events of By Midnight. Aprill Dunne has been in hospital and physical therapy recovering from the wounds she recieved during the attack by one of her fellow students. Her father is dead, and her sort-of boyfriend, Gabriel is dying from a disease that April gave him. From all sides, April feels under pressure to solve several major problems - 1) find some important, mythical book which will cure Gabriel of the disease 2) figure out who the Regent is and kill him, thus releasing Gabriel from his vampireness 3) avenge her father's death. What makes accomplishing these three tasks difficult are many. April's squicked out by her mother possibly already back in the dating scene. The fact that April is surrounded by many vampires and must hide what she is, hide her relationship with Gabriel and pretend to be in with The Faces obviously leads to jealousy issues between April and Gabriel and some serious misunderstandings between April and Caro. And because she has no idea where to start gathering intel on the vampires of this mysterious book, April must jump between thin leads here and there trying to track down any information she can. It sort of felt like a TV crime drama unfolding before my eyes. And I couldn't take my eyes away from this book. I thought that April was unbelievably selfish and immature during A LOT of the book and I found myself huffing impatiently at quite a lot of her attitude and behaviour, but she is still a teenager and has no idea what she's doing, so I kind of understood. There was plenty of action, both in a scary vampire attacking way as well as kissing, both of which made me happy. I love the whole atmosphere of Highgate Cemetery and Ravenwood Academy. And solving this huge obstacles and figuring out the mysteries surrounding vampires and Ravenwood really kept me on the edge of my seat! This book is a wonderful sequel, just as filled with mystery and excitement and romance as the first book and I cannot wait to see where this story will go! I loved this more than the first! I thought it was fabulous.